Policijske snage se sastoje od velikog broja službi i odjela, koji se kreću od specijalnih i redovnih policijskih službi, obrazovanja, treninga, medicinskih odjela, centralnog nacionalnog ureda Interpola, kriminalističke službe, operaciono-taktičkog odjela, istražnih odjela, odjela za borbu protiv narkotika, prometne policije, ljudskih resursa, komunikacija, press službe, financija, logistice i civilne odbrane. Ministarstvo unutarnjih poslova (Azэrbaycan Respublikasının Daxili İşlэr Nazirliyi) je ministarstvo azerbejdžanske vlade zaduženo za održavanje reda i sigurnosti ljudi, objekata i državnih struktura. Ministra unutarnjih poslova postavlja i smjenjuje vrhovnik azerbejdžanskih Oružanih snaga, Predsjednik Azerbejdžana. 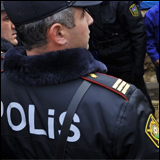 The Ministry of Internal Affairs of Azerbaijan (Azэrbaycan Respublikasının Daxili İşlэr Nazirliyi) is an Azerbaijani governement ministry for internal affairs, which is responsible for keeping the order, security and safety of population, officials, buildings and structures in the country. The Minister of Internal Affairs of Azerbaijan is appointed and removed from the post by the Commander-in-chief of the Azerbaijani Armed Forces, the President of Azebijan. 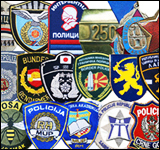 The police force consists of a large number of divisions and departments, ranging from both specialised and regular police divisions, education, training, medical, a National Central Bureau of Interpol, criminal intelligence, administration, investigation and inquest departments, drug abuse control departments, operations and statistics, transportation, traffic police, human resources, communication and planning departments and press services, financial, logsitcs and civil defence. The Aviation Security Administration (UAB), created in 1996, is a structural division of Azerbaijan Airlines CJSC. The Administration carries out its operations in the following areas: aviation security assurance, security guard services, access and onsite control, fire safety, emergency rescue, occupational health and safety, civil defense, special equipment servicing, and video surveillance in the area of civil aviation security. The Aviation Security Administration of CJSC AZAL is the entity that bears direct responsibility for compliance with the requirements of the State Aviation Security Program and the Aviation Security Assurance Regulations approved by Decree No. 613 of the President of the Republic of Azerbaijan, dated April 24, 2012, at the airports and structural divisions of CJSC AZAL.